Assigned tasks can be completed from the Inbox or, in case it is enabled, directly from the email. This allows you to save time and make decisions at anytime anywhere, without the need to log in to Flokzu. Assignes will receive a notification with the fields and buttons that represent the options available to complete the task. 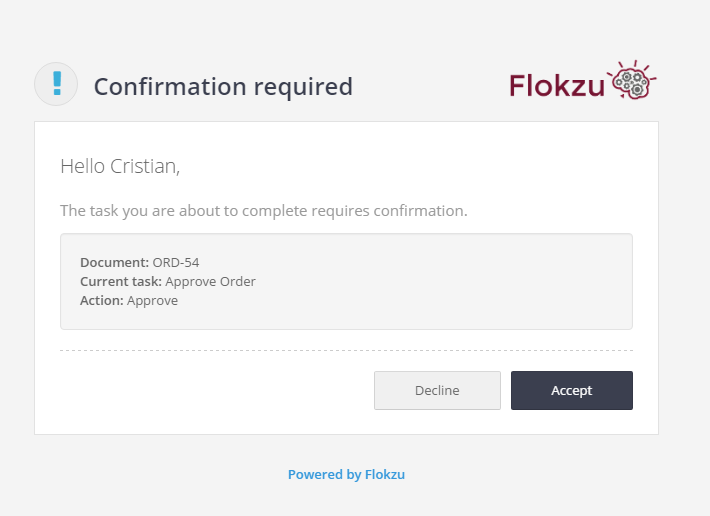 Even though the assignees are notified to their email address about the task to be completed, if they log in to Flokzu, they will see the task in their Inbox. 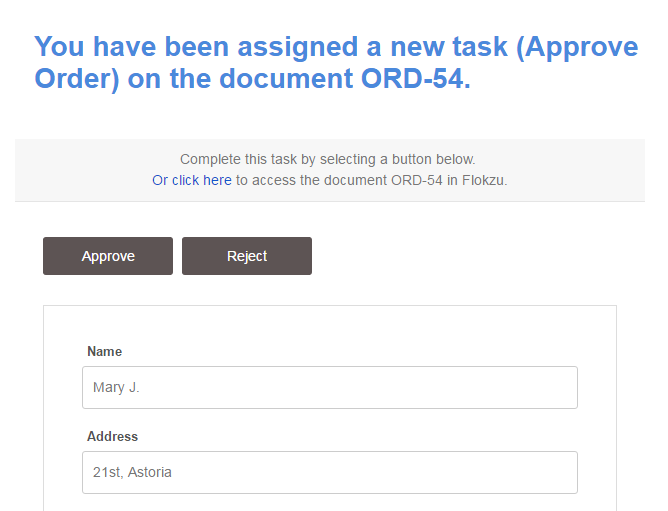 Tasks completed via email function exactly like the ones you complete from Flokzu: the user who completed the task will see it in his/her Outbox during the next 10 days and it will be registered on the process instance history. Important: Assignees to complete tasks via email will be able to view the fields content, but they won&apos;t be able to modify them, add attachments or make comments. The information is there as reference, in case it proves useful to make the decision. To make any modifications, you would need to access Flokzu and complete the task. For tasks which need to be completed outside Flokzu (e.g. Follow up call with prospect, printing a document, send information to provider). The user does whatever he/she needs to do and then confirms that he/she completed the task directly from his/her email address. For tasks that only require the user to notify that he/she has received certain information. The information reaches the user&apos;s email address containing all the form fields and the assignee completes the task by confirming that he/she received it.